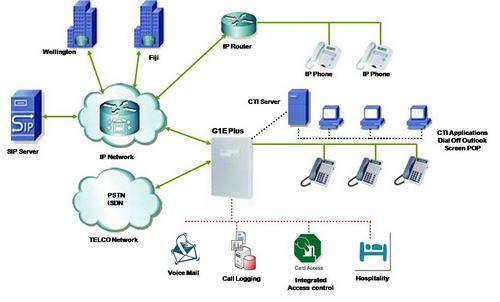 G1E-Plus - Hybrex G1E-Plus, Hybrid VoIP System, fully functional Solution. The G1E+ is a Hybrid IP Communication System combining the advantage of traditional telecommunications along with the convergence of VoIP technology allows a flexible asol ution that best suits the diverse needs of your business. This integrated IP-based capability protects the customers investment and ensures a wide range of options for expanding the customers information and communication infrastructure as their business grows. The G1E+ offers a unique combination of outside line interfaces. It can serve as a branch office system for VoIP multi-site applications. Choose between efficient ISDN lines or PSTN. The G1E+ offers a cost effective thoughtfully designed “Hospitality Solution” for Motels and Hotels with between 5-20 rooms. The G1E+ with its multiple integrated systems means you can say “Goodbye” to training headaches and servicing various equipment types and say “Hello” to a solution that incorporates your desired mix of administrative and Guests telephones, options of Auto Attendant, Room Voice Mail, Front Desk Operations, Guest Services, Call Accounting and Much More. All G1E+ systems are equipped with a standard Auto Attendant and Delay Operator Que. The optional in-skin Voice Multi-Service card will add the following valuable voice service features.